All photographs and text copyright 2015 by Florian Freimoser except where otherwise stated. Powered by Blogger. Of all plants, alpine flowers are my favorite; not a particular type, just about any flowering species. I even wanted to study them at one point, but then changed my plans. Alpine plants are well adapted to the harsh and cold environment in which they thrive and manage to grow, flower and produce seeds during the short vegetative period they have available (in the Alps, the vegetative period decreases by 6-7 days with every 100 m in elevation gain). All these plants are particularly well protected against drought and wind and most are characterized by compact growth and unproportionally big flowers in order to attract the rare pollinators. 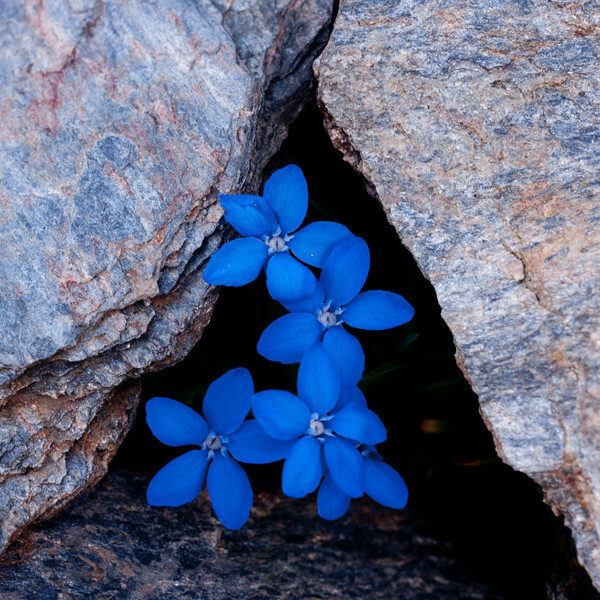 In the photograph above, it appears as if the flowers grew right out of a rock. This impression is deceiving since the plants rather grew underneath the loose rocks that frame the flowers in the picture above. The Bavarian Gentian (Gentiana bavarica) shown here was growing near the Niedersachsen hut in the Goldberg group of mountains, in Austria. These mountains owe their name to gold that has been found and mined there already by the romans or even earlier (some references say as early as 4000 years ago). We also found a few gold dust particles ourselves, but we have not become rich. The Bavarian Gentian is one of over 400 species of the genus Gentiana, which all grow in mountainous regions of the world. Typical for the alpine species, the Bavarian Gentian has mountain blue flowers, but red or yellow flowering species are also found and are more frequent in other parts of the world. Some of the most archetypical alpine plants belong to this genus, and many species are very difficult to separate from each other. For example, the Bavarian Gentian is rather similar to Gentiana vernalis. However, you should most definitely not confuse the Bavarian Gentian with a Schnaps bearing the same name (I really hope that you do not prefer the Schnaps over the flower!). © 2011 Florian's blog. Theme: Ari by Elmastudio. Converted by Smashing Blogger for LiteThemes.com. Proudly powered by Blogger.